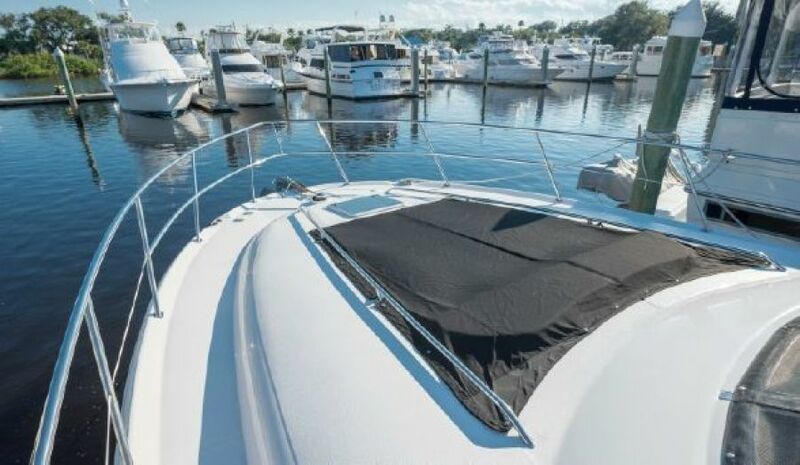 There's no need to travel to exotic locations to get away from it all, for in the Sea Ray 480 Sedan Bridge, there's a vacation haven right by the dock. 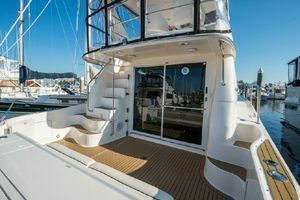 This yacht offers plenty of luxurious living space indoors in the well-appointed cabin, and outside on the stunning command bridge, easily accessed up a molded stairway. 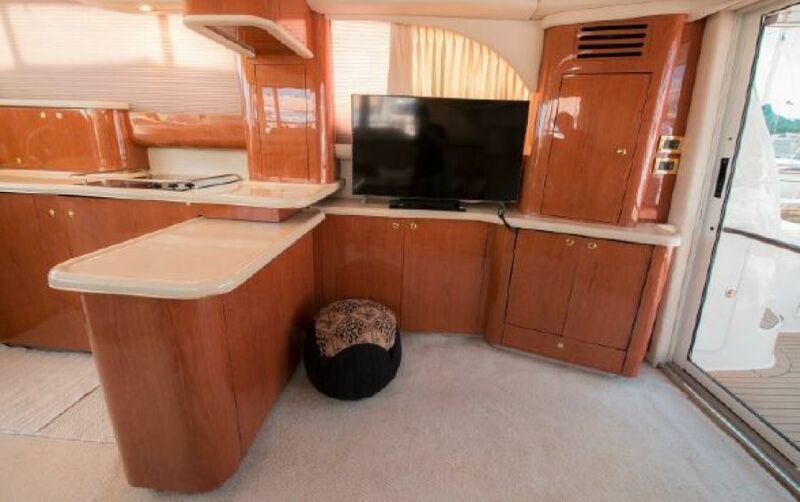 With a fiberglass hardtop and full enclosure, the command bridge is the perfect place to entertain. 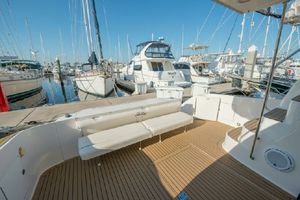 Curved bench seating forward of the helm gives guests a spectacular view while they enjoy the premium Clarion AM-FM digital cassette stereo with a six-disc CD changer, subwoofer, and six speakers with cockpit remote control. 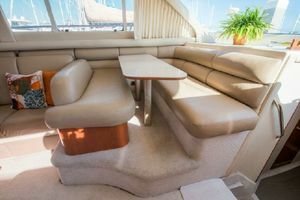 Guests can stretch out and relax in the sun around a bridge cocktail table that converts to a sunpad by adding their matching filler cushions. 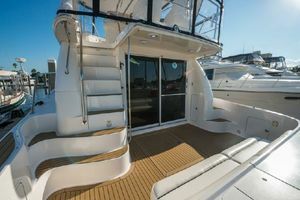 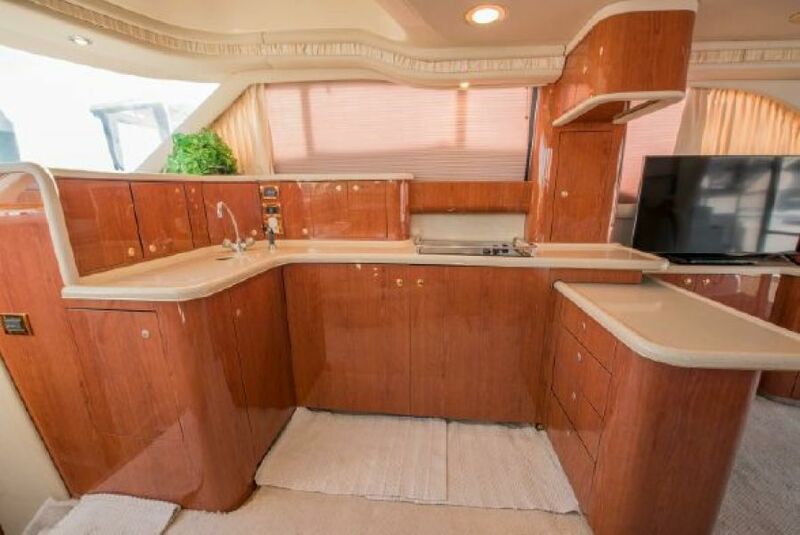 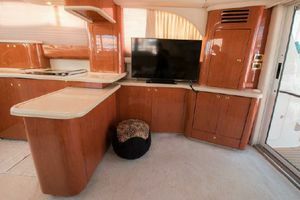 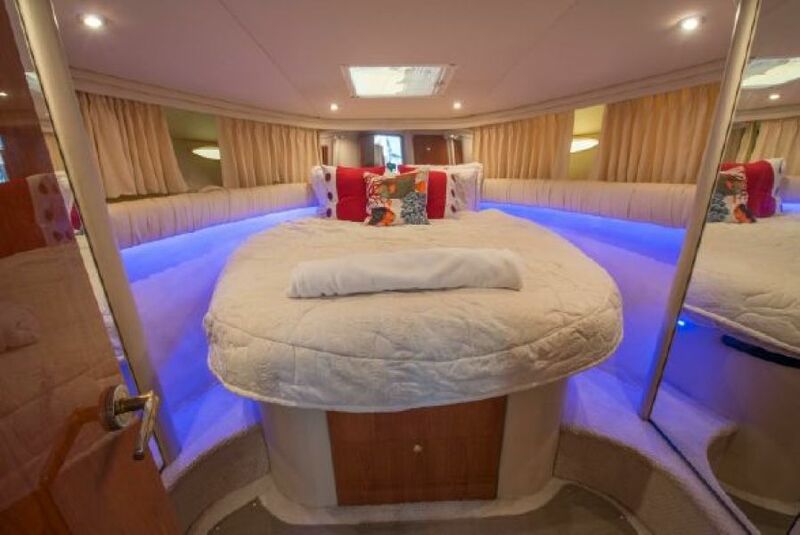 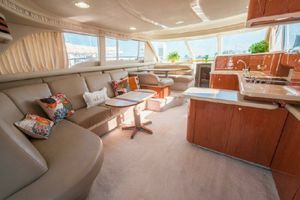 Guests can also help themselves to food and beverages from the fully appointed wet bar - with its built in ice maker - or lounge on the forward deck sunpad. 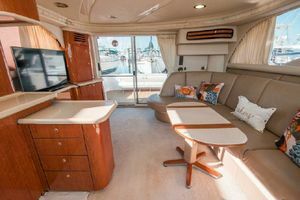 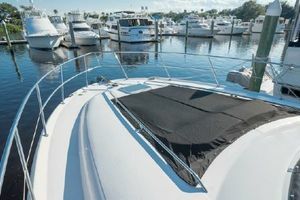 An optional bridge layout plan adds even more room for lounging with a U-shaped bridge seat with aft sunpad, and a portside helm station with dual companion seat. 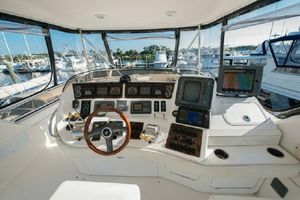 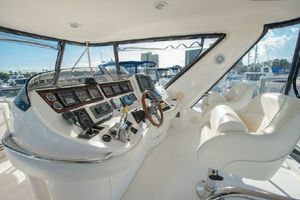 The console is large enough to house a tremendous amount of instrumentation, including a digital LCD systems monitor, while two captain's chairs provide absolute comfort. 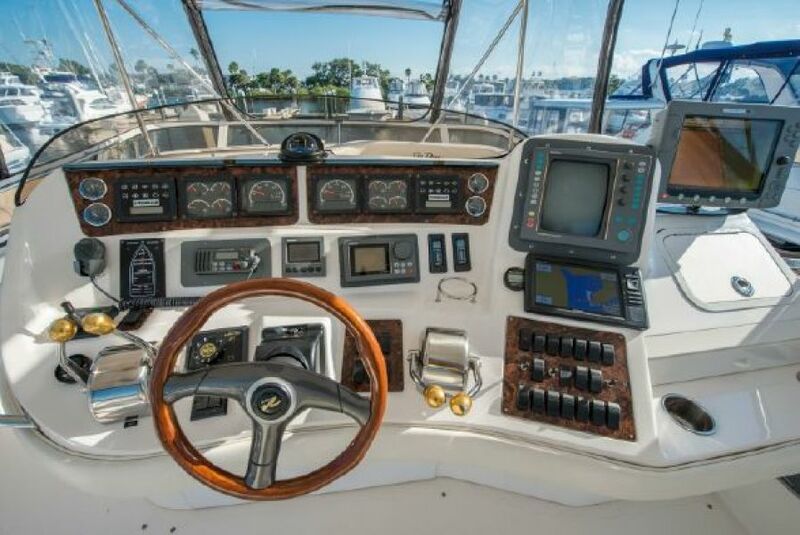 The captain can pilot in total confidence, too. 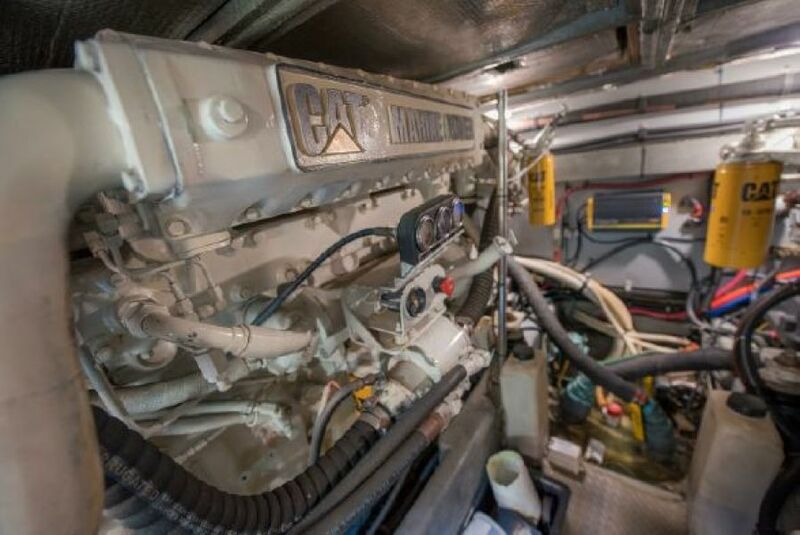 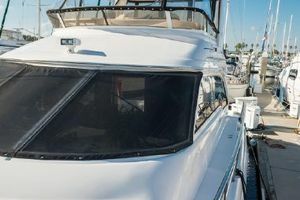 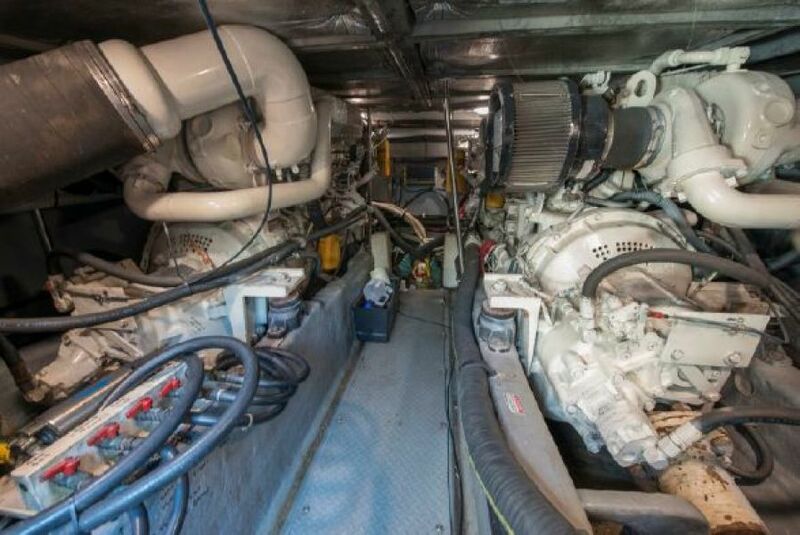 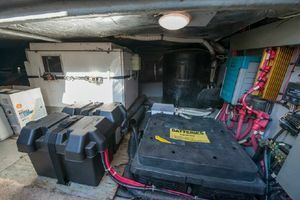 Technical features on the Sea Ray 480 Sedan are complete with an engine synchronizer, crossover fuel and charging system, 10 kW generator with sound box, dockside power through a Glendinning cablemaster and wireless remote, plus a Raytheon electronics package. 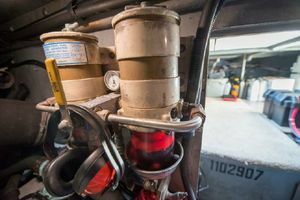 A Power Pac exhaust system with lift system mufflers helps keep engine noise to a minimum, particularly in the cabin area. 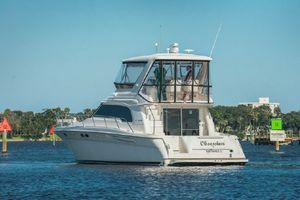 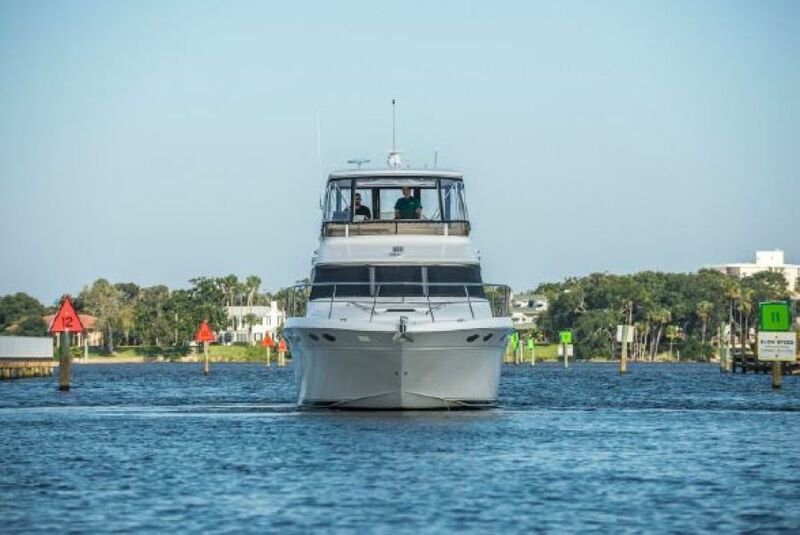 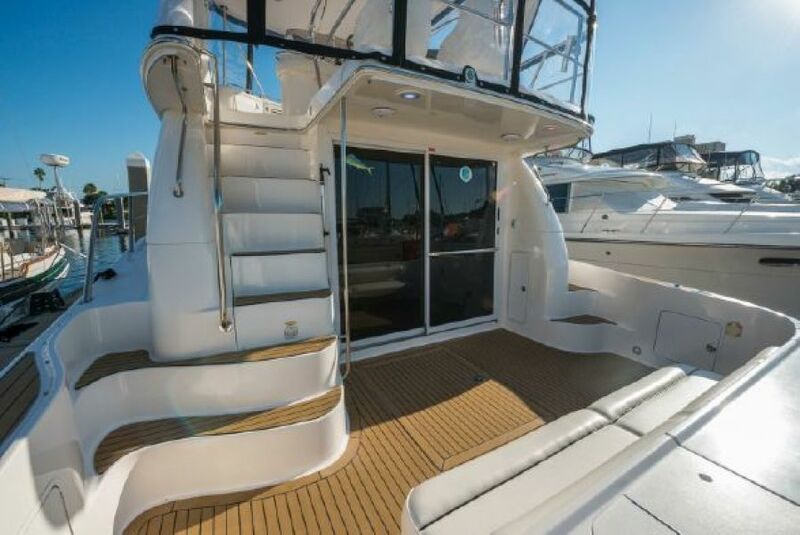 Impeccably designed, the cabin affords travelers easy movement throughout with molded steps to the bridge and deck, plus convenient transom door access to the extra large swim platform. 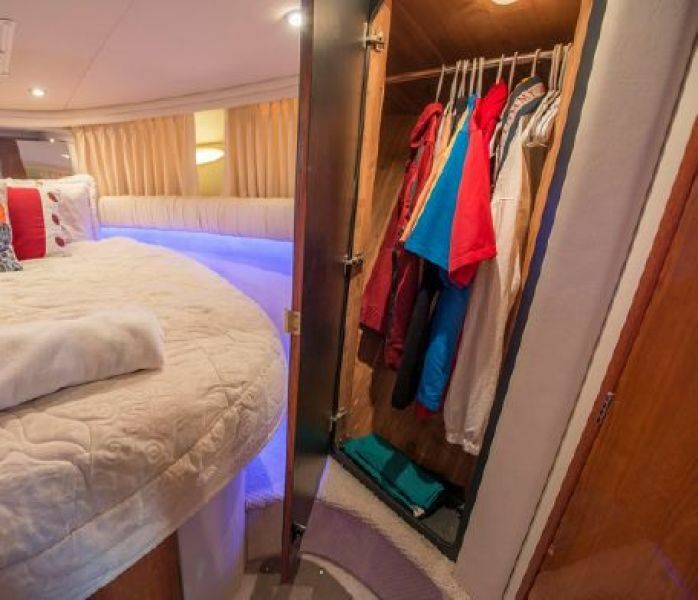 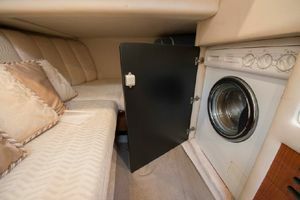 Below, there's a plush forward master stateroom with a full-size pedestal bed, enclosed gunwale cabinets, and an entertainment center with a color TV - VCR combination. 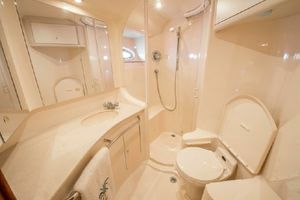 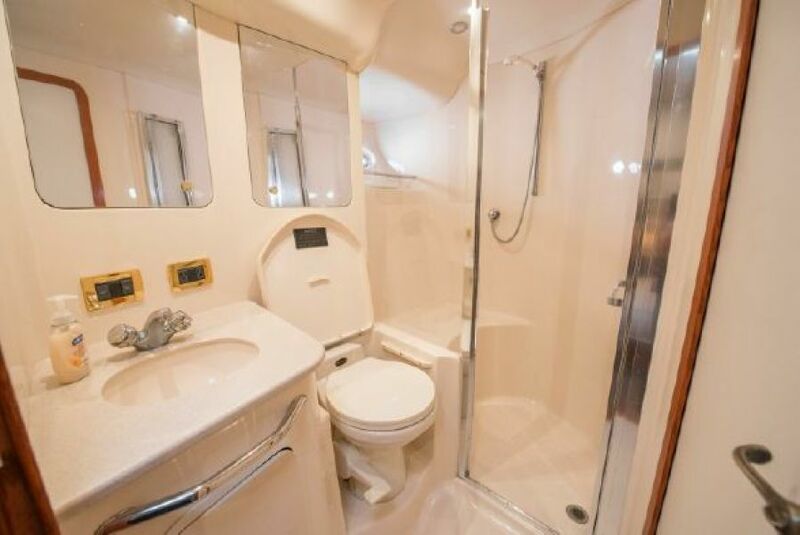 There's also a fully equipped private head with a circular shower and VacuFlush toilet. 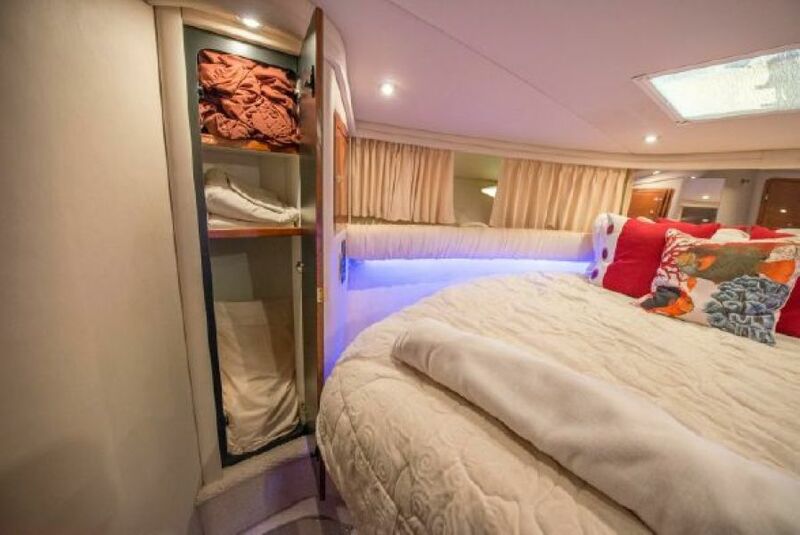 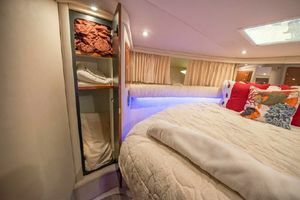 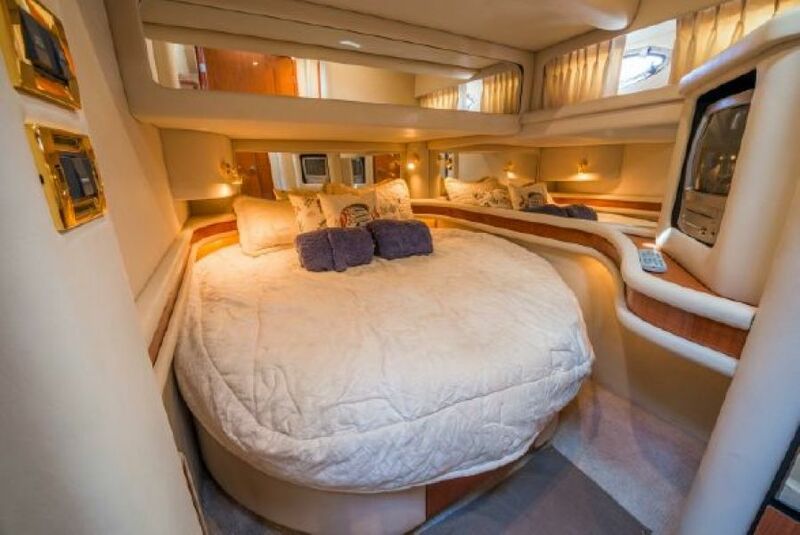 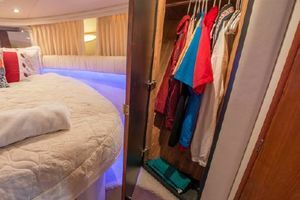 The portside guest stateroom with its full-size bed, circular skylight and private head and shower is so large, the owner might be tempted to use it as the master suite. There's even a third stateroom to starboard with double bunks and a washer - dryer combination. 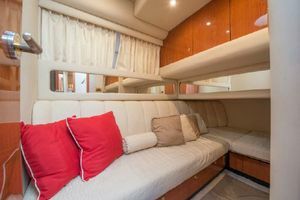 The salon is extremely livable with an electric convertible sofa and an entertainment center equipped with a TV and VCR, Clarion AM-FM digital cassette and CD stereo with six-disc changer and six speakers. 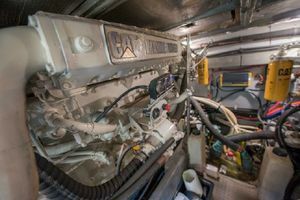 The galley is also fully equipped with a flush-mounted three-burner electric stove, microwave - convection oven, coffee maker, plus a refrigerator and freezer set under the counter. There's also a dinette for four opposite the galley. 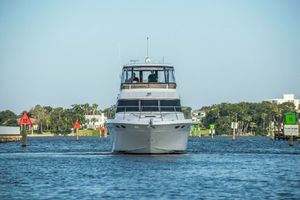 The 480 Sedan Bridge is powered by twin 582 horsepower Caterpillars (CAT3176TA) and superbly constructed with high-performance vinylester resin, 316 stainless steel bow and deck rails, and a self-bailing fiberglass cockpit with a gas-assisted bilge service hatch. 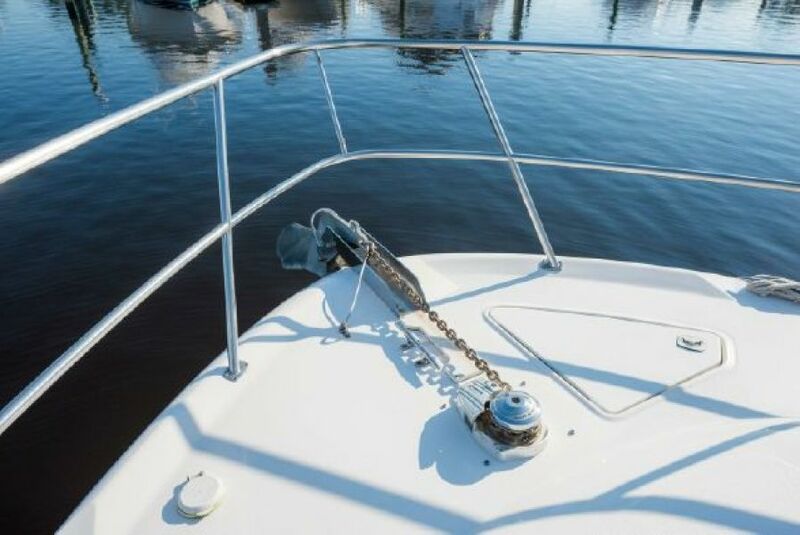 Even underwater, it's protected by seacocks on all fittings and dripless shaft logs with an extra seal carrier kit. 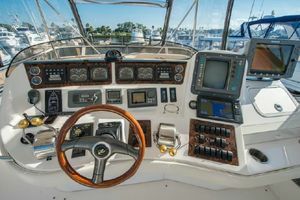 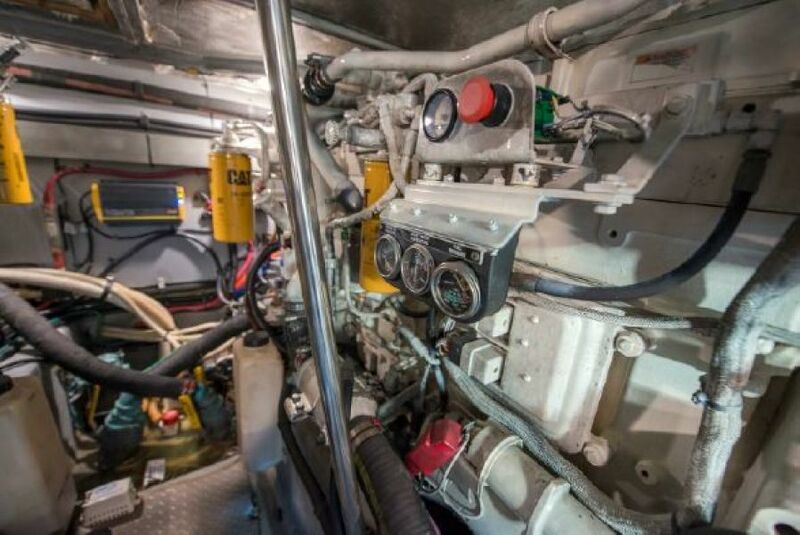 Available options run the gamut from engine and electronics packages to a lower control station. 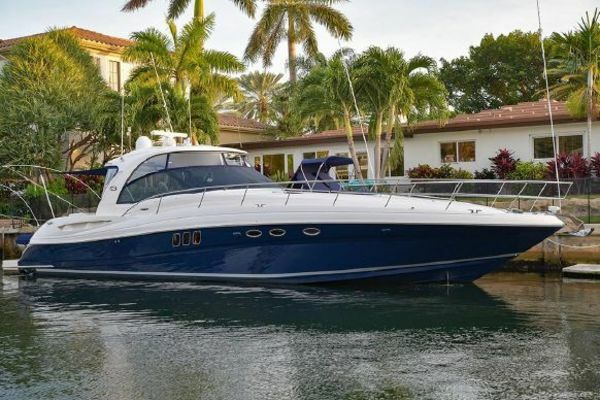 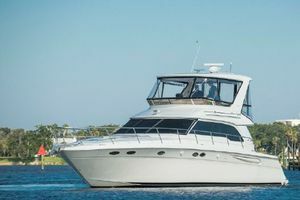 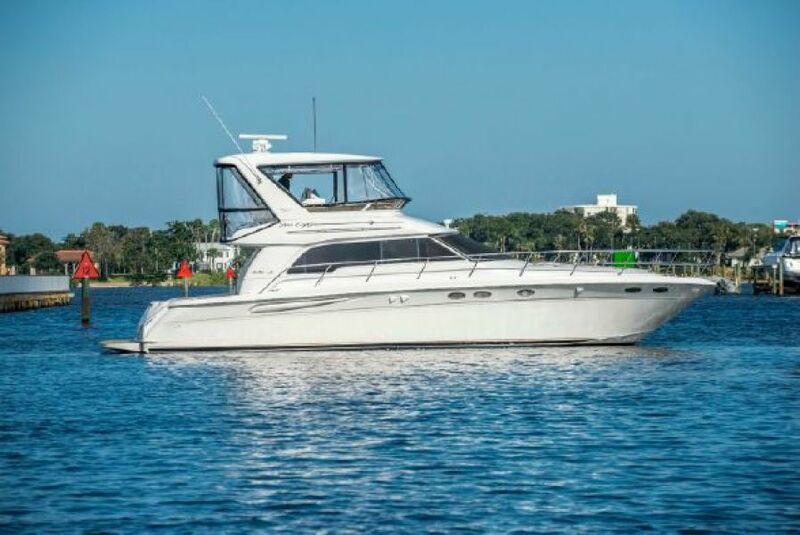 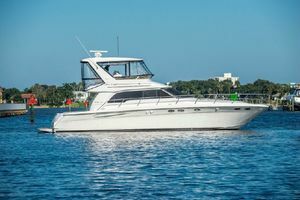 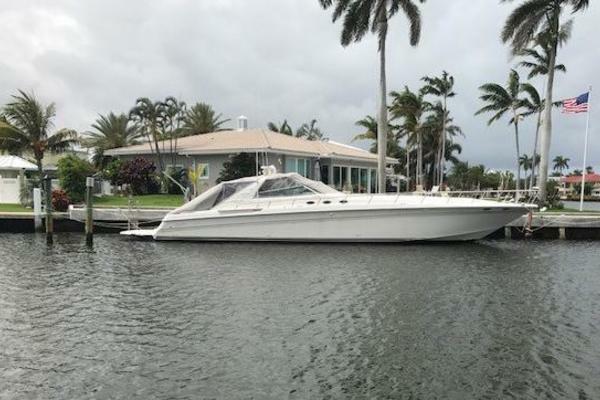 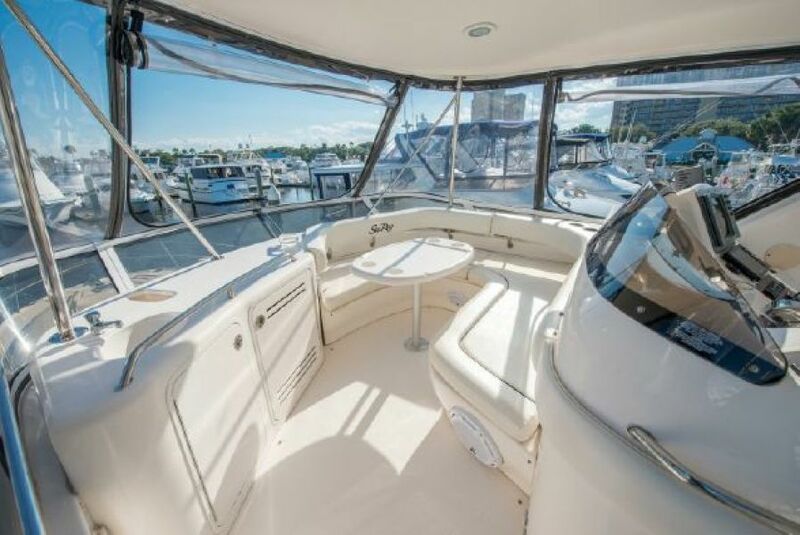 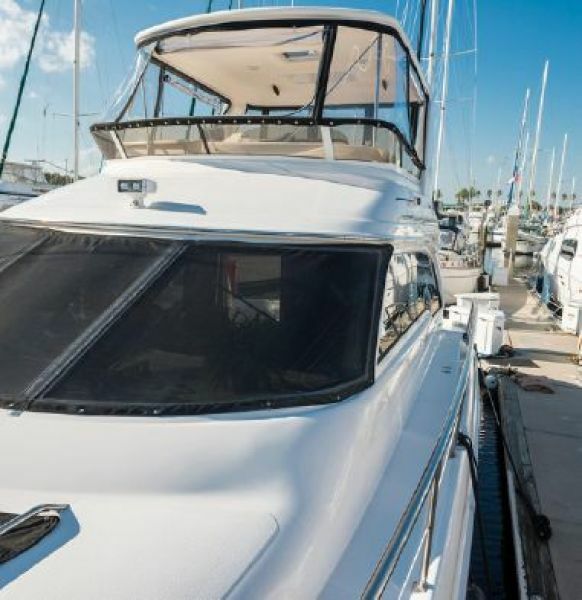 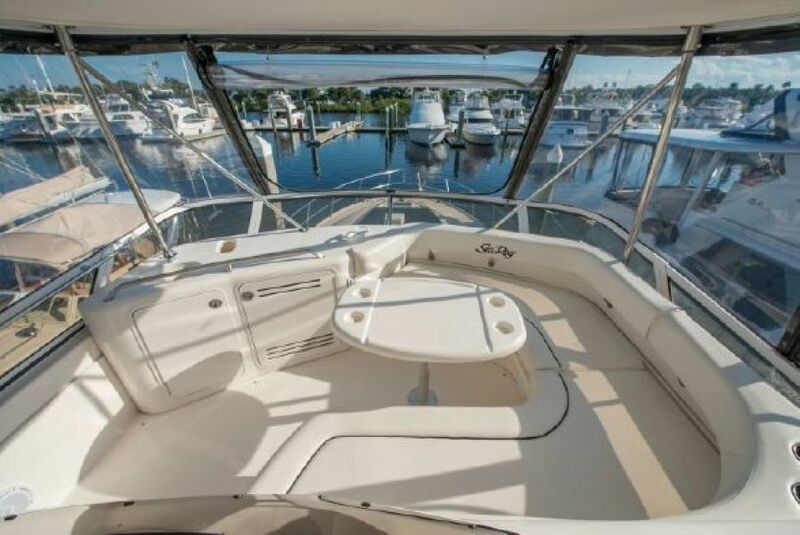 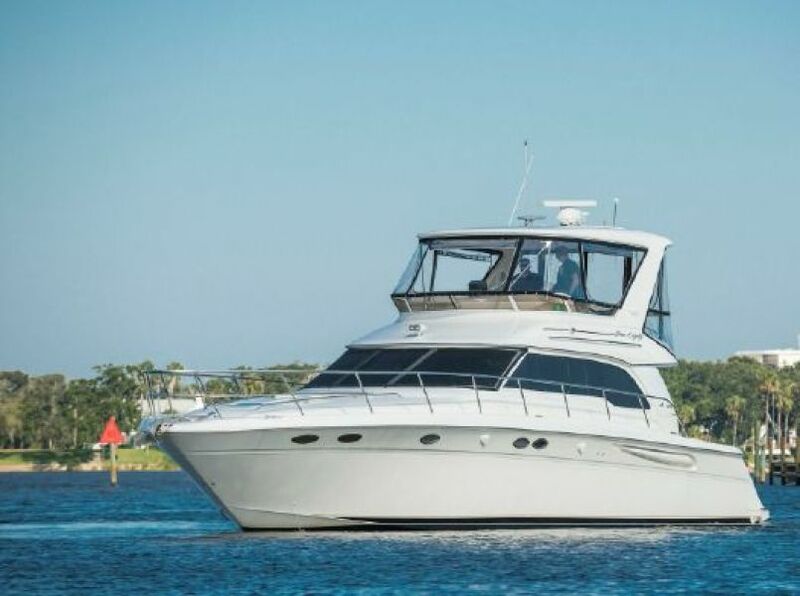 West Florida Yachts would love to guide you through a personal showing of this 48' Sea Ray 480 1998. This yacht for sale is located in Daytona Beach, Florida and priced at $199,900. For a showing please contact us by filling out the form on this page and we will get back to you shortly!